Preheat the oven to 425 degrees and spray a baking sheet with cooking spray. In a large bowl, combine the cream cheese with the salsa, lime juice, cumin, chile powder, cayenne, onion powder, garlic, cilantro, scallions, and 1/4 tsp kosher salt. Fold in the chicken and cheeses. Taste and season with additional salt and pepper if necessary. Working 3 tortillas at a time, stack them on a microwave-safe plate and cover with plastic wrap. Cook 30 seconds, or until tortillas are soft and pliable. Spoon 2-3 tablespoons of filling onto the lower third of each tortilla, and roll tightly. Place seam side-down on the prepared baking sheet. Repeat with remaining tortillas and filling. Spray the taquitos lightly with cooking spray, sprinkle with salt. Bake 15-20 minutes, or until the tortillas are crisp and golden-brown. Serve with salsa, sour cream, and/or guacamole. *This is how I prepare my chicken if I don't have leftover chicken to use: Preheat the oven to 375 degrees. Spread a piece of aluminum foil across a baking sheet, and arrange chicken breasts in a single layer in the center. Sprinkle with salt and pepper, and season as you wish. Fold the aluminum foil over the chicken breasts, and enclose them to form a "packet." Bake the chicken (on the baking sheet) 35-45 minutes, or until it is cooked through. **To freeze, prepare the taquitos, but before baking, place the baking sheet in the refrigerator until the taquitos are completely cold. Wrap each taquito in plastic wrap or aluminum foil, and freeze. 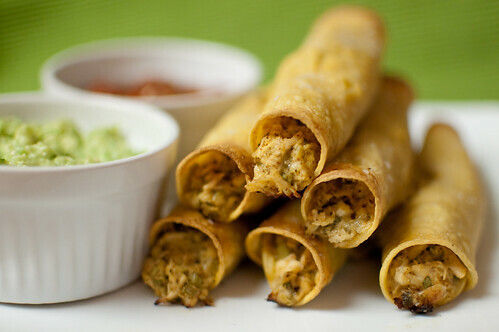 To bake, unwrap the taquitos and cook in a 425 degree oven for 20 minutes (no need to thaw first).